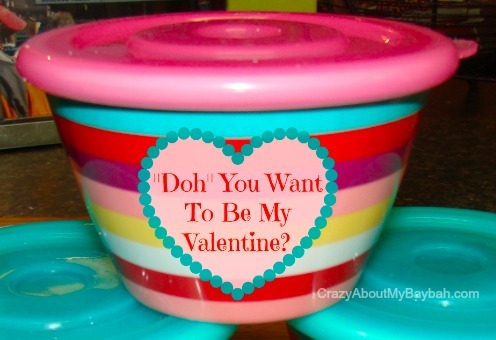 Valentine for Kids | ‘Doh’ You Want To Be My Valentine? EASY and SUPER CUTE Valentine for kids this Valentine’s Day! I was searching for something age appropriate and fun for Sweet Pea and her friends when I came across a play dough valentine on Pinterest and I knew that was it! I loved the idea and the cute little valentine saying!! However instead of purchasing the premade stuff I would make an edible and non-toxic play dough since everything finds its way into her mouth. Years ago while working at a summer camp I found a great Kool-Aid play dough recipe so I decided to dig it up. This is perfect but not limited to your age 1-4 year olds that are curious about tasting everything! In a bowl combine and blend all dry ingredients. Add oil to boiling water and then transfer to dry mix. Mix with spoon until cool enough to knead. Transfer to counter and knead until color is well blended. Store in air tight containers. Create a label on sticker paper with the saying, “Doh” you want to be my Valentine? I purchased these very adorable containers at Target for about $3.00 each but a more budget friendly container works well if you’re buying for an entire class. For that I suggest the Gladware set containing 8 4oz mini rounds for under $3.00 per set. My sister has another recipe for edible clay on her blog made with peanut butter and honey that could also be used! I hope your little one and his/her friends enjoy creating art with this Valentine as much as mine did. *Clarification- while this play dough recipe is edible it is not a snack. The ingredients consist of water, flour, salt, and Kool-aid so while these are edible you wouldn’t want your child to have a bowl of the dough. Also, be aware if your child or Valentine recipient has any allergies to any of the ingredients such as gluten sensitivities. The dough could cause a reaction because of the flour. For a gluten-free recipe try this from parents.com. Love the fun “doh” saying! I used to teach preschool years ago and edible playdough was always a hit with the kids. Great Valentine gift idea! I love this idea!! Thanks! Okay, now that is an amazing gift idea! Who needs chocolate? How cool! I think this would be a big hit. My only concern would be that the younger ids would think it was okay to actually eat play doh. Still think it’s a great Valentine’s Day gift idea. What a cute idea! We actually make a Kool-Aid play dough, but I love the idea of an edible one as a gift. OMGosh, that is so cute!!!! How fun! I love play doh and this recipe sounds great. Thanks. This would also make a good end of the year favor at school, for the kids to give to their classmates! Great tutorial. I am going to make this with my son on Valentines Day! My boys love play doh. What a fun Valentine! It’s always fun to give something different than the norm. We might have to try this. Thanks for sharing! Great idea! I love this for valentines day! Super cute! That is a super cute and festive way to celebrate Valentine’s Day. Neat, I love it. Something the kids can help make and then play with or give as a gift later! Might use it for our next birthday party. Cute gift idea! We love making and handing out homemade Valentines. Thanks for sharing. I am going to have to pin this to make with the kids this month. Very cute! Had to pin this one for next year. i love making homemade play dough! The kids really love it too! Chock full of learning! I love this! So cute and fun! What a fantastic exchange idea and a welcomed break from the usual candy! I’m gonna try this out with my girls. Pinning this recipe right away! This is on our must do craft lists! Thanks so much for sharing the cutest Valentine idea ever! Fun! Love Kool Aid playdough! This is a great idea. I love hte creative Valentines gifts. What a great idea. I never thought about edible play-doh. That is such an adorable gift for Valentine’s Day! This is adorable. I love it.